In a show of solidarity for Denver Public Schools teachers preparing to go on strike, the Shorter Community A.M.E. Church hosted a worship service in honor of educators Sunday. 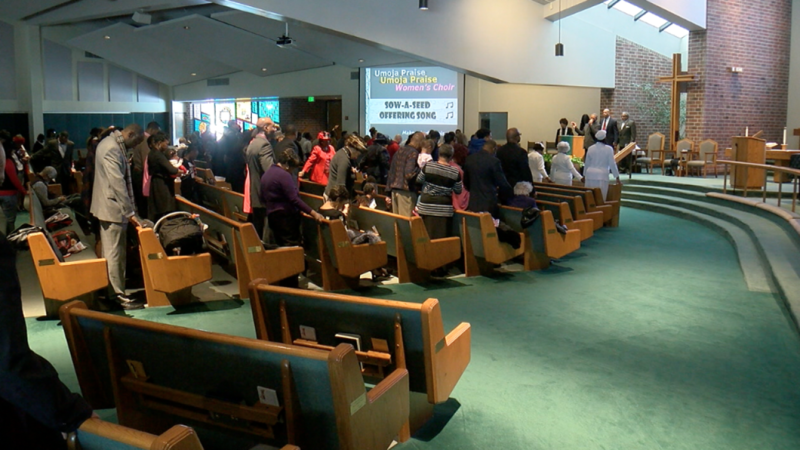 DENVER -- In a show of solidarity for Denver Public Schools teachers preparing to go on strike, the Shorter Community A.M.E. Church hosted a worship service in honor of educators Sunday. Reverend Dr. Timothy Tyler invited teachers and DPS administrators to pray with them for a resolution to the ongoing negotiations between the district and the Denver Classroom Teachers Association (DCTA). “We want to engage our congregation in praying for them and giving tangible support to our teachers as they go on strike tomorrow,” Dr. Tyler said. Not only is the church home to DPS educators, staff members, students, parents and administrators, it also has a history with the district. The church was built on land it bought from the district. “We’re not taking sides, we just want to play the role of helping all sides come together,” Dr. Tyler said. The first African-American woman ever contracted by the district is also a member of the congregation. “She still alive, 105-years-old Marie Greenwood - she’s one of our faithful members and she is sharp as a tack,” Dr. Tyler said. The The African Methodist Episcopal Church also has a long history of protest. The church was founded in 1787 after black parishioners walked out of a worship service when they were not allowed to pray at the same alter as white parishioners. Sunday is the A.M.E. church’s Founder’s Day. “It’s apropos that today, as we celebrate our founder, that we’re also saying we want to support the teachers that are walking out in protest tomorrow in order to get fair wages and to be treated fairly,” Dr. Tyler said. The church collected donations for the teachers strike fund and asked for volunteers to sign up to hand out doughnuts and coffee to teachers and also join the picket line with the union. Dr. Tyler said depending on how long the strike lasts, the church might consider opening up its doors to students to help parents having trouble finding child care. Several teachers donning red showed up to the Sunday service, including Anna Wallenkamp. Wallenkamp teaches first and second grade at Columbine Elementary School and has a son who attends DPS schools. Wallenkamp said she has mixed emotions about the strike. She said there’s some excitement to it that something might change for the better for teachers, but she’s also anxious about an uncertain future with the district and sad about the fact that she won’t be in class Monday. “I’m feeling totally heartbroken that I’m not going to see my students tomorrow and I don’t know when the next time will be that I will see them,” Wallenkamp said. She says parents have also shown their support for the teachers as the 15-month negotiation process played out. “It’s about me, but it’s about you all too, happier teachers and higher teacher retention rates mean great things for the students, too. So, it’s a fight for everybody and everybody will win at the end of this,” Wallenkamp said. She believes the district as a whole will come out stronger at the end of this process with teachers who can put their full attention to their work in the classroom rather than having to pick up second or third jobs. In the end, Dr. Tyler believes it’s a matter of the district and the teacher’s union listening to one another but also valuing what teachers do. He’s hoping the two sides will come to an agreement soon for the sake of the entire community. “I think even one day of striking will just cause havoc in this community and I’m always concerned, especially about children of color, to put this upon the other disparities that we see. It will not help, it will hurt,” he said.